The Leopoldsberg is a 425 metre high mountain on the northern edge of Vienna. From the mountaintop, visitors can overlook the entire city, the outskirts of the Alps, the Marchfled plain down to Bratislava and beyond, and the area North of Vienna. A particularly nice landmark in Klosterneuburg is the monastery there, which owns the small church on the Leopoldsberg. The area around the current church is often called the "cradle of Austria", since it was here that the Babenberg Markgrave Leopold IV built his first castle to defend his little county against Magyar invaders. Today, only individual walls and ruins are left of the original castle. According to legend, it was in this castle that the Countess Agnes, wife of Leopold, was standing at a window when her veil (Schleier) was blown off by the wind. Nine years later, when Leopold was out with a hunting party, his dogs suddenly barked loudly and up on an elderflower tree, he found the veil of his wife again - miraculously in perfect condition. Therefore, the Markgrave founded the monastery of Klosterneuburg, apparently liking the veil a lot. That much about the Leopoldsberg-Klosterneuburg link. 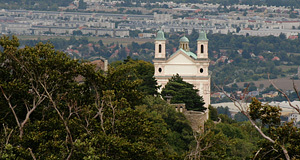 Today, the Leopoldsberg is home to a small, Baroque church that is clearly visible from almost any spot in Vienna. In fact, it is for the view that people come to the Leopoldsberg. If you think that a visit to the Kahlenberg is an inside-tip neglected by too many international visitors of Vienna - try to go to the Leopoldsberg at some point. Unless on a very clear and sunny day, it is almost always very quiet there. Getting to the Leopoldsberg from Heiligenstadt by bus is fairly easy thanks to a direct link - but takes a while and most people get off at the Kahlenberg, where you have a proper platform and restaurant, not to mention the souvenir shops. A few more words on the history of the Leopoldsberg: It was probably first populated around 1300 BC. The oldest written records date back to 1130, already talking about a castle on the site. It was not the first castle on the Leopoldsberg: The Romans had taken advantage of the high cliff above the Danube before. Markgrave Leopold died in the 11th century castle in 1136. Today, he is a saint. In the period of the interregnum between 1253 and 1258, the castle became property of King Ottokar II, Premysl. Once it had fallen to the Habsburgs, it remained an important fortification. In 1287, it protected Duke Albrecht from revolting Viennese. In 1529, when the Turkish troops advanced on Austria upon the occasion of the First Siege of Vienna, the castle on the Leopoldsberg was set on fire, the remains dismantled after the defeat of the Turks. Just before the Second Siege, Emperor Leopold I donated a chapel on the Leopoldsberg in 1679. The building was not completed, when the Turks devastaded the site in 1683. Modern historicists think that the Emperor and Jan III Sobieski, King of Poland, gathered their troops on the Leopoldsberg before they attacked the Ottoman armies - according to popular belief, this was done from the Kahlenberg. In 1693, a Baroque chapel was built on the Leopoldsberg, funded by the Emperor and conveniently named after himself and the Babenberg duke Saint Leopold at the same time. This was also the occasion on which the mountain was officially named „Leopoldsberg". A countryside palace was built on the Leopoldsberg in 1718. The little chapel was dissolved under the rule of Emperor Joseph II, but given to the Monastery of Klosterneuburg and re-opened in 1798. The palace from 1718 burnt down in 1891. In 1935, a road was built from the base of the mountain to both Kahlenberg and Leopoldsberg in an attempt to fight unemployment - it is a cobbled street that required insane amounts of labour. The church and ruins of the castle look somewhat bleak and shabby today. There are memorials for the victims of WWII and some small memorials. If you are up for a bit of a hike, I strongly recommend to hike to the Leopoldsberg. There are several routes from both sides, Klosterneuburg and Vienna. All of them ascend across vineyards and the Vienna Woods and are quite attractive.